First, I bring you Halloween quizzes! Which Pumpkin Carol Are You? You are "Great Pumpkin Is Comin' To Town"! "Great Pumpkin Is Comin' To Town"
To see if you've been spreading gloom, or bringing lots of cheer! 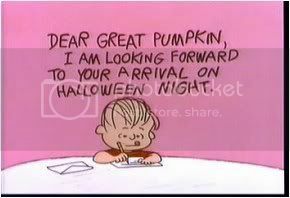 Great pumpkin is coming to town!! Your Halloween song is "Monster Mash"
This Quiz by eldritchhobbit - Taken 181 Times. Literature of the Day: Here's a dark and poignant look at Halloween. The poplars tossed their naked arms. Stared at her as it passed. That was the parish scorn. That bent and broke my heart. "And keep tryst with me?" Was warmer than her tears. You're most welcome! :) Thanks so much for reading. Those extreme pumpkins are *awesome*! I'm so glad you like them! The big-pumpkin-eating-little-pumpkin one is my favorite, I think. Such creativity! I've been enjoying your Halloween posts. Love the poetry especially. It reminds me of an Indian summer poem my hometown paper used to publish yearly. All I can remember of it was that it compared the wisps of smoke from bonfires to dancing Native Americans. I loved it but can't think of the name or author. Does that ring any bells with you? Anyway, thanks for the fun posts. I look forward to more. I'm so glad you're enjoying the posts! Thanks so much for the lovely feedback. I'm not sure about the Indian summer poem, but it sounds beautiful. I'll nose around and see if I can't discover it somewhere. I'd like to read it! I may have shown this to you last year, but is worth repeating. I give you the Dalek shaped Jack-o-Lantern. It even moves and shrieks, "EXTERMINATE!!!!!" Personally I'd go for something more R&B and have it shriek, "KEEL DOCTOR!!!!!" Wow... I can't decide which I like better: the skull pumpkin or the Pumpkin-eating Pumpkin! Aren't those jack-o-lanterns amazing? That pumpkin eating pumpkin one is absolute genius.